This study was performed to explore whether there is a change in views about handson physics activities of the science teachers participated in the project “Amazing Science Lessons, Inquiring Students, and Popular Science” supported by TUBITAK. 58 volunteer science teachers in Bingöl, Elazığ, and Tunceli provinces of Turkey participated in the study. Convenience sampling was utilized. Teachers performed some selected hands-on activities covering physics contents such as mechanics, thermodynamics, and optics through inquiry teaching. There is one group in the study and the survey with 12 four-point Likert items for measuring views about hands-on activities developed by Uzal et al. (2010) was used just prior and after the treatment. In addition, a focus group interview was conducted after the treatment to support the quantitative data qualitatively. Consequently, although there was not a significant difference between pre-test and post-test scores, there was a slight decrease in views of males while females’ views were rising at one level. Bu çalışma TUBİTAK tarafından desteklenen “Neşeli Fen Dersleri, Sorgulayan Öğrenci ve Sevilen Bilim” projesine katılan fen bilimleri öğretmenlerinin Basit Araç-Gereçlerle yapılan Etkinliklerle (BAGYE) ilgili görüşlerinde bir değişim olup olmadığını incelemek amacıyla yapılmıştır. Çalışmaya Bingöl, Elazığ, ve Tunceli illerindeki 58 gönüllü fen bilimleri öğretmenleri katılmıştır. Yani çalışmada uygun örnekleme kullanılmıştır. Öğretmenler proje kapsamında mekanik, termodinamik ve optik konuları gibi fizik konularını kapsayan bazı seçilmiş BAGYE’leri sorgulamaya dayalı öğretimle yapmışlardır. Çalışmada sadece tek grup vardır ve çalışmanın öncesinde ve sonrasında veri toplama aracı olarak Uzal vd. (2010) tarafından geliştirilen ve 12 maddelik bir Likert ölçeği olan BAGYE’lerle ilgili görüş anketi uygulanmıştır. Aynı zamanda proje sonunda öğretmenlerle odak grup mülakatı gerçekleştirilerek nicel veriler nitel verilerle de desteklenmiştir. Sonuç olarak fen öğretmenlerinin BAGYE’lerle ilgili son-test ön-test puanları arasında anlamlı bir fark çıkmasa da bayan fen öğretmenlerinin görüş puanlarının çalışma neticesince bir miktar yükselirken bay öğretmenlerin görüşlerinde çok az düşme gözlenmiştir. Bu etkileşim küçük bir etki büyüklüğüne sahiptir. Odak grup mülakatında ise öğretmenler daha önceden değişik nedenlerle fen derslerinde BAGYE’lere ya da deneylere yer vermediklerini dile getirmişlerdir. Proje neticesinde bahsettikleri problemlerin BAGYE’lerin fen derslerinde kullanımıyla ortadan kalkacağını dile getirmişlerdir. Nitel olarak fen öğretmenlerinin BAGYE’lerle ilgili görüşlerinde olumlu ilerlemeler olduğu görülmüştür. Arı, Ü., Peşman, H. vd. (2016). Fen bilimleri öğretmenlerinin bilimsel süreç becerilerinin gelişimi. Uluslararası Türk Eğitim Bilimleri Dergisi, 4(7), 44-52. Balagun, T.A., ve Odubunni, O. (1991). The effect of lecture teaching methods on cognitive achievement in integrated science. Journal Research in Science Teaching, 28, 213-224. Blanchard, M. R., Southerland, S. A. vd. (2010). Is inquiry possible in light of accountability? : A quantitative comparison of the relative effectiveness of guided inquiry and verification laboratory instruction. Science Education, 94(4), 577-616. Bogdan, R. C. ve Biklen, S. K. (2007). Qualitative research for education: An introduction to theories and methods. Boston, MA: Pearson Education, Inc.
Büyüköztürk, Ş., Çakmak, E. K. vd. (2014). Bilimsel araştırma yöntemleri. Ankara, Türkiye: Pegem Akademi. Colburn, A. (2000). An inquiry primer. Science Scope, 23(6), 42 – 44. Fraenkel, J. R., ve Wallen, N. E. (1996). How to design and evaluate research in education. McGraw-Hill. George, D., ve Mallery, P. (2003). SPSS for Windows step by step a simple guide and referance 11.0 update (4th Ed.). Boston, MA: Pearson Education. Hake, R. R. (1998). Interactive-engagement versus traditional methods: A six-thousand-student survey of mechanics test data for introductory physics courses. American Journal of Physics, 66 (1), 64. Huber, R. A., ve Moore, C. J. (2001). A Model for Extending Hands‐On Science to Be Inquiry Based. School Science and Mathematics, 101(1), 32-42. Lee, O. (1995). Subject matter knowledge, classroom management, and instructional practices in middle school science classrooms. Journal of Research in Science Teaching, 32(4), 423-440. Rao, D. B., ve Kumari, U. N., (2008). Science process skills of school students. Arora Offset Press, Laxmi Nagar, Delhi-92. Savran, A. ve Çakıroğlu, J. (2003). Differences between elementary and secondary preservice science teachers’ perceived efficacy believes and their classroom management believes. The Turkish Online Journal of Educaitonal Tezhnology, 2(4), 15-20. Schwab, J. J. (1962). The teaching of science as enquiry. In J. J. Schwab ve P. F. Brandwein, The teaching of science. Cambridge, MA: Harvard University Press. Settlage, J., ve Southerland, S. A. (2007). Teaching science to all children: Using culture as a starting point. New York: Routledge. Welch, W.W., Klopfer, L.E. vd. (1981). The role of inquiry in science education: Analysis and recommendations, Science Education, 65, 33–50. Uzal, G., Erdem, A. vd. (2010). The evaluation of teachers’ opinions about hands-on science experiments and the performed in-service training. 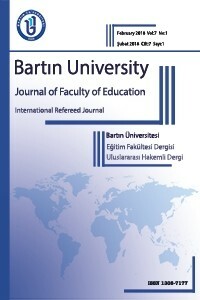 Necatibey Faculty of Education Electronic Journal of Science and Mathematics Education, 4(1), 64-84. Yılmaz, H. ve Çavaş, P. H. (2008). The effect of the teaching practice on pre-service elementary teachers’ science teaching efficacy and classroom management beliefs. Eurasia Journal of Mathmatics, Science, ve Technology Education, 4(1), 45-54.